Ahhh, it’s always fun to look at the referrer log in WordPress and see who is linking to me and how much traffic they send me. Here’s mine from today. What are some trends here? Arrington rules. Techmeme is OK. Where’s the rest of the traffic? We are talking to ourselves. Mike. This is the real danger. I think I’ll go back to Facebook where 140 million people are hanging out. Next Post The best 2009 web development tool? For some reason I always assumed a TC link would be worth tens of thousands of clicks. Only 43 people out of all your twitter peeps actually clicks through to here? I find it interesting that FriendFeed sends as much or more traffic than techmeme. Yeah, but remember techmeme has a relatively small unique traffic count. The vast majority of people, even TC visitors never go near it. I’m still surprised that you don’t have any traffic from Facebook. But you’re right, you are only talking to your mutual tribes ( to use a Godin-ism) but isn’t that the point? Does it matter if it is 140 million, 140 trillion or 1,641? Is it the message or the ratings that drive you and Mr. Arrington? I really have to ask….how did you get so many twitter followers? All of this innovation is only ever any good if it a) is useful and b) achieves widespread adoption – we are in danger of “disappearing up our own arses” here – and I’m delighted you have brought this to people’s attention Robert. Commentary (however valuable) about social media innovations is only ever truly valuable to the very people innovating, interested-in or working within the bubble/echo chamber – so where does the bridge to mass-adopters come in? Mainstream users of “social software” do so because it is useful to them and their friends, NOT because they read about it in a tech blog. Without a bridge to the mass-market, few investors are likely to see a way to recoup their investments, or at the very least, monetise them. Something has to change. Can YOU be that man Robert? Could I? And this a new revelation? It’s been a circular game from the get-go. People with real lives and real accomplishments, don’t have time, nor obsess over the A-List blogger political dances. And Facebook is fake friends pure. pretty ballsy to show that your own homegrown audience across reader, twitter, and friendfeed is in the triple digits. 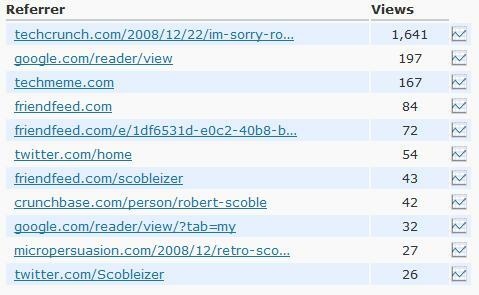 To be quite honest, take a look at this guy Scoble’s FriendFeed. Do you see anything on it that has anything to do with the physical world? It’s quite horrifying to look at, really. He’s blogging about blogging tools. He’s blogging about blogging about blogging. Even so, you must wonder if there is any solid ground left underneath his layers of commentary. What did he originally want to blog about? Does he have some sort of goal in mind for his life? When will he return to the physical world? This has been an interesting conversation both on TC and your response here as well. Possiblly one of the better and deeper ones all year, right to the heart of most Web 2.0 issues. Well, maybe it has something to do with what you’ve done (or not done) to your blog over the past year? No one was coming to your blog anymore, and many of the TC people are old Scobleizers coming back for another look, to see if you’ve decided to start taking your blog seriously again. That’s my story, at least. I used to be a daily reader, then basically forgot all about you for several months. Not surprised. Robert’s interviews, comments, insights are always much more about himself, self promotional, interrupting the guy we want to hear. It will sort it self out. Robert you are right. Although it is meaningful that services such as Friendfeed and Techmeme are providing ways for people to discover contents from like-minded people, bloggers really need opportunities to meet with many different people from disparate backgrounds. Otherwise the blogosphere will stop evolving. Everything will be talked over and over without adding any significant value. Innovations take place when you take a brilliant idea from one field and apply it to another, and this is only possible when people can discover other *unlike*-minded people and interact with them actively. The reason why blog is so powerful is that it’s decentralized. There is a great potential to this because you are not constrained in terms of who you get to interact with, compared to other *centralized* websites where you only interact with people with same interests. The blogosphere needs to evolve in a way that bloggers can leverage this extremely valuable quality–the decentralizedness–to bring out the most value. Tech bloggers should connect with music bloggers. Music bloggers should connect with political bloggers. Political bloggers should connect with tech bloggers. There are lots of unseen similarities and relevance lying around the web. We should be able to connect those dots and interact with each other effectively.